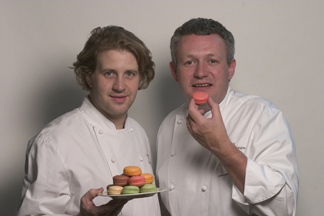 Parisian Chefs Florian Bellanger and Ludovic Augendre of Mad Mac tempt the palate with inspired recipes for Madeleines and Macarons, the most traditional of French pastries. Meeting recently with Florian Bellanger and Ludovic Augendre, the owners of Mad Mac, I learned that besides being the creative geniuses behind the inspired flavors of Madeleines and Macarons (the company name is a play on words of their products), that they also share similar backgrounds. They both grew up in Paris, graduated from culinary school specializing in pastry, and they both worked at the crème de la crème of Paris pastry shops, Fauchon Paris. Looking to expand his culinary experience, Florian moved to New York where he was the pastry chef at Le Bernardin. A few years later when Fauchon opened a New York location, Florian and Ludovic teamed up again, Florian working as the Executive Pastry Chef, and Ludovic as the Sous Chef. Having met Florian during his Fauchon New York days, I knew that he is a dedicated professional who is passionate about the pastry he creates, and meeting Ludovic, I knew that he too, shared this passion. I was delighted when I learned that they had struck out on their own to create Mad Mac, because if you have ever visited Paris and tasted Macarons and Madeleines, then you know how special these sweets are, and also how difficult it can be to find their high quality outside of France. Mad Mac opened in July 2007 and specializes in Madeleines, the luscious little French cakes baked in specially designed shell-shaped pans, and Macarons, delightful little cookies with crisp shells made with almond flour, sugar, and egg whites that are lighter than air and have incredibly decadent cream fillings sandwiched between the layers of cookies. Much to the enchantment of connoisseurs, MAD MAC products come in an astonishing range of intriguing flavors, and are also sold online on their website, www.MadMacNYC.com. 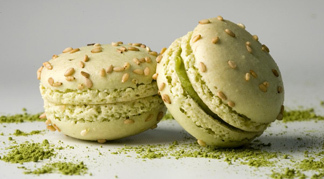 Chef Florian Bellanger and Chef Ludovic Augendre share tempting recipes for their Hazelnut Madeleines and their Macaron Matcha with roasted sesame seeds to provide you with a taste of Mad Mac until you can place an order online. Method: Preheat oven to 375° F (191° C). Butter and flour Madeleine pans carefully. Melt butter and let it cool. Beat eggs, salt, and sugar together until thick, about 8 minutes. Add vanilla. Fold in flour, rapidly but gently. Fold in butter gently, but make sure it does not settle to the bottom. Quickly spoon mixture into Madeleine pans, sprinkle with some hazelnuts. Bake until golden. Remove from pans and cool on racks. Macaron Method: In the bowl of an electric mixer fitted with paddle attachment, combine the almond flour, confectioner's sugar, and the matcha. Add one egg white and the apricot jam. Whip until smooth. Slowly add the sugar and whip until firm. Add one-third of the remaining egg white and mix by hand with a rubber spatula until shiny. Preheat oven to 375° F (191° C). Fill a pastry bag with the macaron batter. Pipe the macaron shells on a sheet pan lined with parchment paper, no more than one-thick diameter. Sprinkle with toasted sesame seeds. Let rest at room temperature until the cookies dry a bit, form a thin skin, and does not stick to your finger, about 15 minutes. Bake for 12-14 minutes. Matcha Green Tea Cream Filling Method: Place the white chocolate in a mixing bowl. In a small saucepot, bring the milk to a boil and then add the matcha. Pour the hot milk over the chopped chocolate. Let sit for two minutes then begin whisking slowly until the mixture is smooth. Whisk in the butter until completely incorporated. Refrigerate overnight. Assembly: Flip over the macaroon so they are flat side up. Using your thumb, press in the center of each cookie, forming a small indentation or well. Fill a pastry bag with the cream filling and pipe a small amount in the well of half of the macarons. Sandwich the filled macarons with the unfilled cookies. Refrigerate until ready to serve. Bon Appétit! 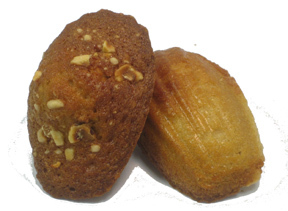 Mad Mac Madeleines, Macarons, and Cakes by Mad Mac, are distributed wholesale nationwide to the Hospitality and Food Service industry, and are also available retail on the website: www.MadMacNYC.com. To learn more about Mad Mac, please read the article on Mad Mac in the Luxury Products section.